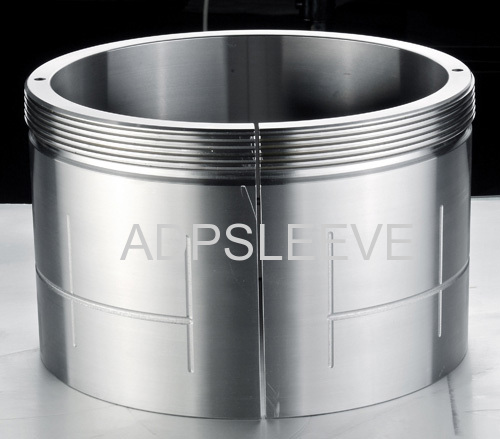 To enable the hydraulic mounting to be used for mounting and dismounting, ADP withdrawal sleeves with bore diameters of 200 mm and above are produced as standard with oil supply ducts and distributor grooves. AOH sleeves have two oil supply ducts at the threaded side as well as oil distributor grooves in the circumferential and axial directions, both in the outside surface and the sleeve bore. If oil is injected through these ducts and grooves, an oil fil is formed between the mating surfaces of the bearing and sleeve and between the shaft and sleeve, and the force required to mount the bearing is considerably reduced. 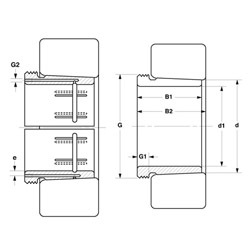 Details of the thread for attaching the oil supply lead to the ducts as well as of appropriate hydraulic nuts can be found in the product table.